Every company's goal is to stand out and distinguish itself from its competitors within the same industry. Although having great products is one of the best ways to achieve this as a business, this is no longer enough and each business must learn how to rise atop the rapidly increasing competition. Having a corporate uniform, especially if your company deals directly with the public can make a great impact on the business in terms of building its brand. Corporate wear is of great benefit not only to the company, but to the employee and customers as well. Corporate uniforms always convey a sense of unity and collaboration among the employees and this gives them confidence as they go about their daily duties. Uniforms promote a sense of belonging among the employees, and make new staff feel as part of the team. Wearing company uniform creates a sense of equality amongst the employees, creating less pressure for them to spend money on their looks and focus more on building the company. This also eliminates office fashion competitions as well as inappropriate dressing that may not go well with the company and general public. Corporate clothing presents a professional image to the public, and also makes the workplace more professional as none of the employees will dress casually. Uniforms also influence employee behaviour, since they know that their actions may either build or tarnish the company’s name and thus will remain conscious of their engagements and interaction with the public all the time. Uniforms also save employee time thus helping them spend more time on the job. Since most uniforms are made from fast drying materials that are tailored towards employees working conditions, the clothes are often comfortable thus making the employees work well in their various positions. For instance electricians may be issued with overalls because of the kind of work they engage in. Having the correct uniforms for your employees is an excellent way to market yourself and improve the company's brand. The uniforms may be designed to incorporate the colours of the organization, and some companies may also consider printing their personal logos and company slogans on the uniforms as a way to sell the business. A good uniform will always communicate the business’ values to the customer and this mostly results in increased sales. A corporate uniform may also keep the staff motivated and create an environment for the business to thrive. This as well, motivates the employees who will feel part of the company and thus work together as a team to drive profits. Corporate wear promotes a sense of employee loyalty to the company since the company will be spending extra (sacrificing) on the employee. The Company can build a strong reputation of itself through staff uniforms and this helps maintain customers as well as acquire new ones. The staff will also be able to stand out at company events and will easily stand out from the crowd. A company that introduces corporate uniforms does not have to worry about meeting safety and organizational standards in terms of the dress code. When employees dress in corporate clothing, it becomes easy for customers to identify them and approach them for any assistance or information regarding the company. This is especially important if your employees interact more often with the customers on a one-on-one basis or if you organize company events that are attended by the public.<? <p>It is always difficult for clients to interact with your employees when they are casually dressed, as this may give them a negative impression of the company and as a result you may end up losing prospective clients. While corporate uniforms are considered to be beneficial, they do not have to be sophisticated or expensive, neither should they be unappealing. The uniforms must be comfortable and eye catching and must not necessarily be a full set of clothes. It could simply be a shirt, badge or sweater. A company can also invest in different sets of uniform to break the monotony of having to wear the same clothing every day. 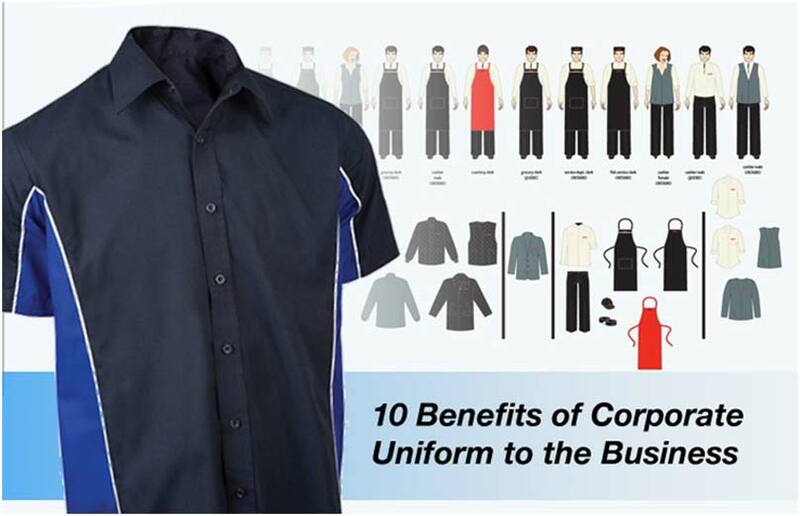 Corporate uniform is recommended for all organizations despite the size, because of the great benefits that cannot be ignored.